Fall River, Massachusetts, was quiet, remarkably ordinary little mill town tottering on the brink of obscurity until the morning of August 4, 1892. 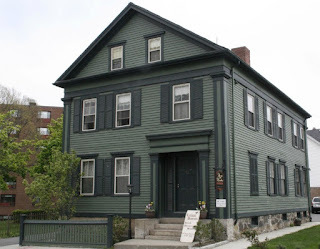 That’s when one of the town’s most upstanding citizens—a mousy, unmarried woman name Lizzie Andrew Borden—was arrested and thrown into jail for brutally murdering her father and stepmother with an axe. By the time her trial was over, Lizzie Borden had become a household name across America. To some she was a demigoddess who should be hanged for her crime. To others, especially many in women’s right groups, she was an innocent “symbol of womanhood” who stood falsely accused. Also leaping to her defense were upper-class citizens and fellow churchgoers who found it difficult to believe one of their own could do such a thing. Even thought Lizzie Borden was eventually acquitted, she remained guilty in the minds of millions of Americas. After her sensational trial, which lasted thirteen days and attracted worldwide publicity, she went back to a quiet life of modest affluence in the same gray frame house on Second Street where the grisly murders had taken place. By then, however, the damage to the former socialite and Sunday school teacher’s spotless reputation had been wrought. The press, fueled by rabid public interest in the case, continued to run banner headlines focusing on the gory murder for years after the event, while crime writers and their publishers made fortunes telling and retelling the story. 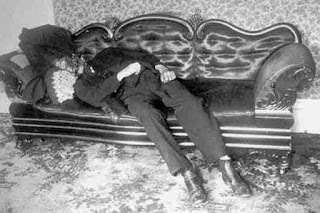 It seemed that, guilty or not, Lizzie’s Borden’s Once proud name would forever be linked to the gruesome events of August 2, 1892. The question remains, more than a century after the fact: Was she guilty? Or, as was suggested at the trial, did some unknown person slip into the house and slay the elderly parents while Lizzie ate pears upstairs and a servant woman worked in the kitchen less than twenty feet from one of the victims? No motive for an outside murder has ever been clearly established, even though several robberies had been reported in the neighborhood in the days immediately prior to the crime. According to police reports, the Borden’s house itself had been burglarized at least twice. 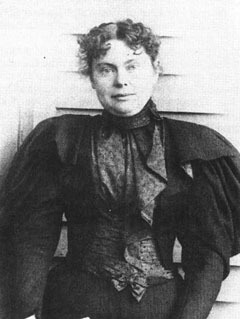 But because of several factors, Lizzie Borden remained the most likely suspect. At her trial, she gave a bewildering array of conflicting stories about her whereabouts during the murder. At first she said she was in the “backyard.” Later, she said she was “in the loft getting a piece of iron for the sinkers.” To another interrogator, she was in the barn eating pears. More puzzling, however, was her neat appearance and calm composure when the police arrived. Surely, they reasoned, her clothes and hands and hair would have been splattered with the victims’ blood. That is, if she ere, in fact, guilty. And the murder weapon? Where was the murder weapon? A few days later an inspector rummaging through the Borden tool shed out back found a freshly cleaned axe head. Could this have been the cruel device that ended the lives of Abby and Andrew Borden? The fact that the wooden handle, from which it would have been difficult to remove bloodstains, was missing convinced investigators that this was, indeed, the weapon. Then new evidence surfaced that further damaged Lizzie’s defense. Upon request, she had turned over to police a spotlessly clean, fancy blue bengaline dress she swore she had worn on the day of the murders. That story seemed unlikely, however, no one wore party dresses of bengaline, a heavy corded cloth, around the house in the August heat. Confounding the problem was a testimony provided by a neighbor, Alice Russell, who reluctantly admitted she had seen Lizzie burn a blue cotton dress in the kitchen stove three days after the murders. The dress, Lizzie explained, had been soiled with brown paint—a color, noted the prosecutor, not unlike that of dried blood. But an outraged press, supported by the public, rallied behind the frail, soft-spoken woman. Editors wanted to know how anyone could accuse “this innocent and loving daughter” of such heinous crimes without feeling ashamed? After all, this was the height of the late Victorian era, a time when the gentleness, physical frailty and docility of the well-bred American woman were cornerstones of society. New Englanders were certain that well-brought-up Christian daughters like Lizzie Borden could not possibly commit murder with an axe on sunny summer mornings. Women possessed more “natural refinements,” as one editorial put it, “diviner instincts” and stronger “spiritual sensibilities” than did men. Overlooked in the public outcry against her arrest was the glaring fact that she stood to inherit a fortune of several hundred thousand dollars. Also, nobody pointed out that Lizzie and Abby had feuded frequently, mainly over matters involving Andrew Borden’s money. In the end, the jury returned with the only verdict possible under the circumstances—not guilty. The judge, who had admonished the jury men to remember that such “a woman of refinement and gentle training...could not have conceived and executed so bloody a butchery,” seemed genuinely pleased at the decision. On June 1, 1927, she died at the age of sixty-six and was buried alongside her stepmother and father in Oak Grove Cemetery. But the public fascination with her case lived on, a favorite of crime writers, movie producers and directors, and even choreographers and playwrights. In 1965, an opera entitled Lizzie Borden: A Family Tragedy in Three Acts met favorable reviews. 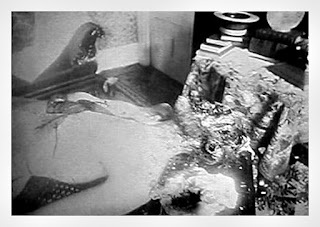 In 1980 Blood Relations appeared, a play in which Lizzie kills for her parents’ money, then dies after being found guilty. 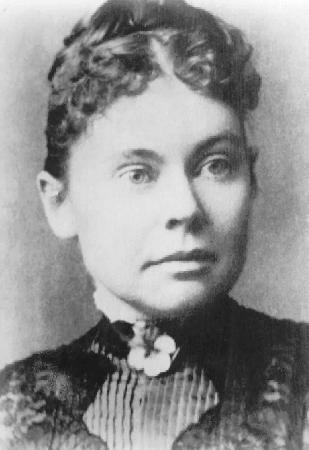 In her own time, Lizzie Borden had become a cause célèbre of the women’s movement and an example of Christian piety. Her acquittal was seen as a tribute to the American justice system and its main tenet of innocent until proven guilty. Some skeptics pointed to Mr. Borden’s bizarre relationship with his youngest daughter. “Daddy’s little girl,” as he called her, almost always got her way. When his mutilated corpse was found, Lizzie’s graduation ring was still on his little finger. This happened several months after he beheaded all of Lizzie’s pigeons in their barn—the same barn in which Lizzie supposedly ate pears while the murders took place.